I've been using a skincare regimen that's been really showing positive results for me and I just had to share it with you! 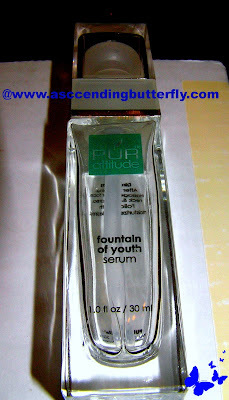 I'm a big fan of serums and have been using PUR Attitude's 'Fountain of Youth' Serum during the day and in the evening after removing makeup I have been using Aveeno's Positively Radiant Intensive Night Cream and I can tell you this combination has been a major one/two punch for my skin, they have been doing so much for my skin that even family and friends have noticed a difference, and what I love is how quickly I noticed the difference using them. This non-toxic, anti-aging serum combines peptide science with an exclusive blend of Hyaluronix technology to visibly increase the collagen and elastin matrix for firmer skin and less visible wrinkles. It's dubbed as a Botox alternative and much like the Fountain of Youth of Lore, is said to be able to 'turn back the hands of time'! Aveeno Active Naturals Intensive Night Cream + Sleep Mask in Influenster Box! I normally like to let each product have it's own day in the sun and feature them seperately, but because they have worked so well for me using them daily in tandem, I had to share them with you together. The day serum isn't cheap at $90 for the 1 fl oz, but for me price isn't nearly as important as efficacy is. This product works, and I noticed a difference immediately, and on the few days that I don't use it, I notice it and that says alot because I'm using quality cosmetics. So if on a day I don't use the serum I can still notice a difference made up, then that's proof in the pudding it's doing what it says it does! What I love is that a very little goes a long way with this. My skin is oil/acne prone and this did not clog my pores and just makes my skin feel incredible and the firming properties are really noticeable! 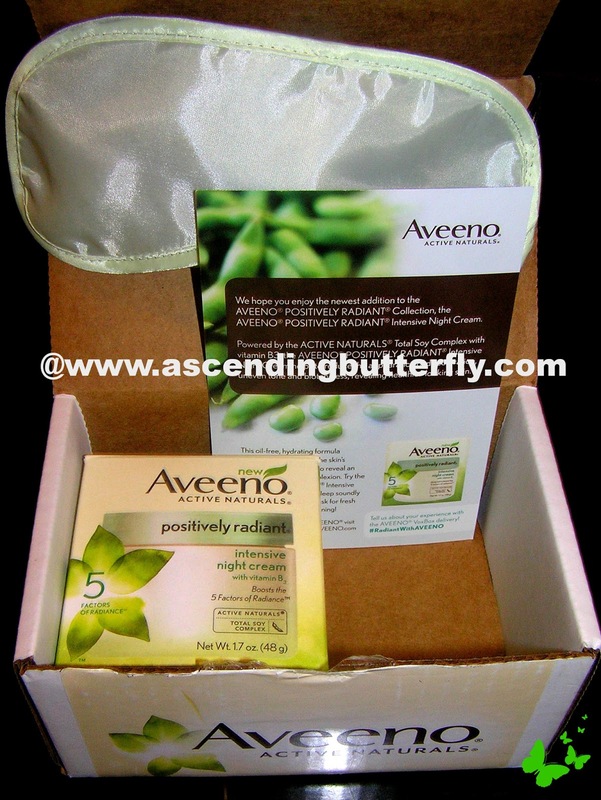 As you guys know I have been testing Aveeno Active Naturals before receiving this wonderful bundle of love from Influenster (which included a sleep mask, how cute is that? ), you can read HERE for our previous coverage of the line, but I can tell you that despite using such a phenomenal serum by day, after I wash off my makeup when I go to put my Aveeno Active Naturals Intensive Night Cream on, my skin literally drinks it in! I love the scent and even make sure to put it on my neck and decolletage at night too! It makes my face feel softer and smoother and in a very short time I noticed a difference in brown spots and my skin's luminosity. I have a lot of brown spots and acne scars which I normally cover up with makeup if I get enough time before running out the door in the morning. With this night cream I actually feel like I'm addressing the problem in a way that makes a more permanent difference than makeup can alone. And at $16.99 for the 17 oz jar this one is definitely a steal! These are both working very well as a skin 'tag team' of sorts! And considering my skin is oily/acne prone, I love that neither one clog my pores, nor do they make my skin feel greasy in any way. On days where time is crazy and I forget to use either one I do see a difference and it's a great reminder to stick to this effective skin care routine! Have you tried Fountain of Youth/PUR Attitude or Aveeno Products? Share Your Experiences with us. What is your daily skincare ritual Butterfly? FTC Disclosure: Ascending Butterfly was provided product samples of both products for editorial consideration, however all opinions expressed in this review are 100% my own. We share products that we feel will benefit our readers and blog using all Ethical Blogger Standards and Guidelines. You can also check out our Full Disclosure Policy for more information. I have tried Aveeno day cream and I really like it. It really moisturizes my skin and I love that it also has spf sun protection.